Southwestern Dry Rub Seasoning spices also known as Santa Barbara Smoked Seafood Rub are perfect for meat and seafood. Jake's Southwestern Hickory Dry Rub for sale is a rich and delicious blend or all natural New Mexico styled dry rub. Perfectly blended with New Mexican Chili powder, cayenne pepper, cumin, Hungarian paprika and more. This delightful balance of herbs, spices and salts combine to enhance the flavor of beef, chicken, seafood, chops, steaks and a whole host of vegetables, potatoes, and snacks. Blended in our standard All natural form these dry rub spices and seasonings are free of preservatives, gluten, MSG and artificial sweeteners. These bbq dry rub blends will improve the flavor of your best Chilean Sea Bass recipes, Halibut, Snapper, shell fish, lobster and slow cooked fully seasoned barbecue dry rub ribs recipes. 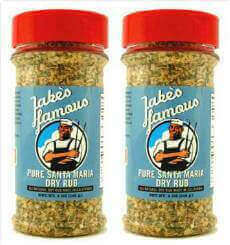 Use this award winning blend to make Jake's Dry Rubbed Salmon or Jake's special tri tip dry rub. Want great hamburgers, shake in 2 Tablespoons of Southwestern Hickory Dry Rub to every 1/2 pound of ground beef. Want great oven style Southwestern ribs, shake on 2 tablespoons of Jake's Southwestern Hickory Dry Rub onto one rack of ribs. Wrap the ribs and let rest for 45 minutes. Set the oven to 225 degrees. Put the foil wrapped ribs into a large pan and place in the oven for 2 hours. Check the temperature of the meat after one hour. When the ribs reach your desired temperature cut a slit into the top of the ribs and baste on Jake's Southern Style Original Mild BBQ Sauce. Turn the oven to 350 degrees and cook for an additional 15 minutes. Let the ribs rest for 5 minutes then serve. Jake's Southwestern Hickory Dry Rub for sale goes on easy by shaking on, letting rest for under and hour then taking right to the grill. These dry rub seasonings are guaranteed easy and fast. In no time at all you'll be enjoying the full flavor of this Southwestern Hickory bbq dry rub for sale. Here's what Jake's wants you to do next: click Add To Cart and follow the process to Checkout. Order Jake's Famous Natural Southwestern Hickory BBQ Rub Now. Your family and friends will wonder how you did it. Our Southwestern Seafood Seasonings blend will make you the hero of your kitchen or back yard BBQ!